The battle of Jutland was the only large scale naval engagement of the First World War, when the German High Sea Fleet left its anchorage in the Baltic to engage the Royal Navy Grand Fleet in the North Sea, off the coast of Jutland. This engagement lasted from 31st May to June 1st, 1916. It is less well known than the long, grim conflicts of Ypres or Paschendale, perhaps, but it had far-reaching consequences in relation to the war’s final outcome. The German fleet was under the operational command of Vice-Admiral Franz Hipper, and under overall direction of Admiral Reinhard Scheer. Hipper’s opposite number was Sir David Beaty, himself commanded by Admiral Sir John Jellicote. Germany was starved of vital war materials and food supplies by the British blockade of the Baltic ports. Her aims were thus to breach this blockade, destroy at least part of the British fleet and in turn blockade Britain’s channel ports, including those used for disembarking troops on the French side. It would also prevent supplies of ammunition reaching those fighting in Flanders. The stakes for both sides could not have been higher. Hipper planned to use his light battle cruisers to lure the main British fleet into the path of the main German fleet, which had a screen of submarine pickets cruising ahead of it. But the Admiralty knew that a major operation was imminent from intelligence reports and signals intercepts. On 30th May, Jellicote rendezvoused with Beaty, passing over the German submarines, which, because of delays in preparing the German surface fleet for battle, were operating on the very last of their fuel and oxygen supplies. Hipper almost succeeded in luring Beaty into the front of the main German surface fleet, but Beaty retreated out of danger just in time, losing 2 battle cruisers out of 6 and 4 battleships. The main German fleet then moved to the main engagement, pursuing Beaty but losing 11 ships in the process. Britain, however, lost 14. Jellicote attempted to manoeuvre his depleted squadrons between the German ships and their home bases under cover of night, but Scheer managed to elude the trap without any more serious damage and then returned to the sanctuary of the Baltic sea. Both sides claimed victory, but it was an indecisive engagement. If there was a loser, though, it was Germany. Her surface fleet never again left the Baltic during the remainder of the war. In part because of this, Germany was slowly starved into surrender. It was forced to declare unrestricted submarine warfare soon after Jutland, with events such as the sinking of the Lusitania a result. It brought, or at least hastened the arrival of, America into the European war on the side of the Allies. Once this happened, military defeat for Germany on the Western Front was assured. Beaty and Jellicote were heavily criticised at home. 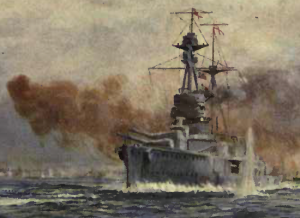 The British public expected a victory with the “Nelson touch” – a repeat of Trafalgar. In his defence, Jellicote argued that his plan of engagement was known in advance and approved by the Admiralty and that the preservation of the British fleet was essential to Britain’s future naval supremacy. Churchill defended Beaty, pointing out that he was the only man who could have lost us the war in the space of one afternoon. That statement alone should be a reason to remember Jutland. The British Labour Market: Where’s that Feel Good Factor?